Jessica winning our coveted Great Pumpkin trophy on Halloween. I’m Jessica, the new Manager of Teen and Gallery Programs. Although you might have seen me before in Late Night Creations, I formally joined the Museum in November 2015. As an artist, I thought I’d tell you a little more about myself through one of my favorite forms of art-making: zines! Working with teens is the best part of my job. Teenagers are routinely the most enthusiastic and excited people I come across. Listening to what they’re interested in and thinking about is like getting a glimpse into the future (be advised: the future is bright). 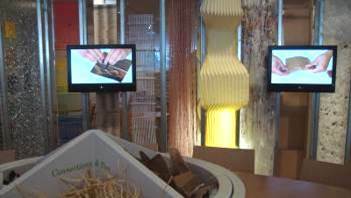 I didn’t know museum education careers existed until I started volunteering in C3 in 2012. Museum education combines all my interests and allows me to give back to my community. If I weren’t working at the DMA, however, I would probably be a window dresser at Neiman Marcus or Bergdorf Goodman. If you enjoyed the zine, check out the upcoming Urban Armor: Zine Making workshop on January 23rd. We’ll be making a zine inspired by Spirit and Matter: Masterpieces from the Keir Collection of Islamic Art. Hope to see you there! After 16.5 years at the DMA, JC Bigornia, Manager of C3 Programs, is heading across the freeway to take the position of Manager of Mobile Innovation at the Perot Museum of Nature and Science. JC is our McGuyver, always ready with an ingenious, perfect solution for any and every art-making challenge we throw his way. For his last day at the Museum, we’re taking a look not just at the countless small and brilliant projects he brought to life through his freakish artistic talent, but the way in which his worked shaped our department in larger ways. JC is a creative and diligent art educator who has managed and taught thousands of programs for museum visitors during his tenure here. He worked with people of all ages, guiding them in careful looking at works of art from the collection and then making connections through an art making process. He was at the helm of our popular Late Night Studio Creations, the drop-in art making program that hosts over 250 multi-age visitors each month. And for many years he led the drop-in weekend family Studio Creations that took place on every Saturday and Sunday all year long. He spent the summers managing logistics for the Summer Camp Program for children and teens, as well as many other family programs too numerous to mention here. JC has a pretty high coolness factor that was perfect for his accomplishments of working with teens—a focus he originally started back in 2008. In 2013 he was the Project Manager of the IMLS Teen Learning Lab planning grant in partnership with the Perot. For that he spent extensive time researching teen developmental learning, designing innovative programs, and launching a DMA/Perot Teen Advisory Council (TAC). This project boosted his already popular Urban Armor program and launched Maker Club the Thursday night program focusing on the intersection of art and science. 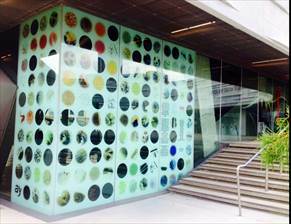 He recruited and met bi-monthly with the thirteen member TAC team, and collaboratively led experimental programs, visiting artist projects, and community projects in partnership with other Dallas organizations. JC brings extensive artistic skills to the programs he designed. I can’t tell you how many times during the development process he had to test and produce project samples. He would say, “I’ll just make that.” And a short time later he would share a creation that was absolutely incredible. And this year, the popular teen themed Late Night in June was developed and run by JC’s teens. JC is a terrific listener and thoughtful which makes him an excellent supervisor to our volunteers and interns. They adore working with him. They enjoy his creative ideas as well as the support he gives them. He is genuinely interested in the people he works with and takes the time to get to know everybody. I’d like to publically thank him for his outstanding work at the DMA with our visitors. In case you—like all the rest of us here—would like to siphon off a little of JC’s talent and take some art-making adventures of your own, check out his many DIY tutorial blog posts on how to make: sounds prints, printed t-shirts, etchings with cola, vinyl toy mini-amps, collagraphs, and cosplay armor and accessories. In his new position, JC will oversee the Perot’s fleet of Mobile Innovation trucks so look for him on the streets–taking learning into the community! We’re gonna miss ya, JC! Teens, adults, hipsters, parents, and those strolling the halls of the DMA were treated to a wonderful evening of spoken word, music, and light last Thursday, when Denton-based collective Spiderweb Salon hosted a poetry showcase with fifteen readers and musicians. The artists included participants from the Center for Creative Connection’s adult programs and Urban Armor teen programs mixed with well-known poets and musicians from the Denton area who are currently part of the Spiderweb Salon. Make sure to follow Spiderweb Salon on Facebook and stay connected to what is happening in the Center for Creative Connections! Printmaking is one of my favorite mediums. There’s something satisfying and magical about transferring an image you created onto another surface. Plus, there are so many fun and experimental ways to do it that make learning new techniques a joy and not a chore. I especially love finding alternative methods to techniques that may otherwise be cost-prohibitive for the at-home printmaker–namely, intaglio and lithography. This idea of alternative processes was the basis of April’s Urban Armor workshop for teens. One of the techniques I taught was a version of lithography appropriately dubbed “kitchen lithography” because most of the supplies can be found in your pantry. Popularized by Emilie Aizier, there are lots of tutorials on how to do it on various internet sites. Finding a perfect guide is hard because the process is finicky and everyone does it in a slightly different way. It’s definitely something to experiment with on your own, but I’ll share what gave me the most consistent results. If you’ve never tried lithography before, it basically consists of creating a master image on a plate (usually metal or stone); in this case, cola is used to etch the image into aluminum foil (it contains phosphoric acid–yum!). Printing from the plate works on the principle that water and oil repel each other: the plate is first coated with water, which doesn’t stick to the etched image because of the gum arabic in the cola. Oil-based ink is then rolled onto the plate, which sticks to the image but is repelled everywhere else by the water. Several months back, the DMA hosted the wonderful exhibition Posters of Paris: Toulouse-Lautrec and His Contemporaries that not only featured fantastic lithograph posters from the late 1800s, but highlighted many of the tools and steps involved in lithography. Cut a piece of foil slightly larger than your sheet of plexi. Carefully smooth it down so it’s nice and flat; try to avoid creating any folds or wrinkles. Fold the edges of the foil around the plexiglas and tape them down to the back. Use your sponge to wet the surface of the foil with a little water, then sand it lightly with your scrubber until it’s dull and no longer super shiny. Wipe the surface down with white vinegar to clean off the plate. When the surface of your plate is dry, draw an image on it with a Sharpie permanent marker. If you are adding text, remember to write backwards (your print will be a mirror image of your plate). After you’re finished with your drawing, make a cola bath for your plate: fill a shallow pan (big enough to accommodate the plate) with about 1/4″ of soda. Then place your plate in the cola drawing-side down. Let your plate soak in the cola bath for 10 minutes or longer. Remove the plate and rinse it in the sink, gently trying to remove as much of the Sharpie drawing as you can. Dry off your plate, then buff the surface using a small amount of vegetable oil and a paper towel. This should help remove the last bits of marker. Even though you may not be able to “see” your drawing any more, don’t panic! The cola should have etched it into the foil, creating a “ghost” image. Load your brayer with ink: spread a small amount of ink on a paper plate, then roll it out with your brayer until the entire surface is coated evenly with ink. Set the brayer aside. Set your plate face-up on the counter. Wipe down the entire surface with a wet sponge. 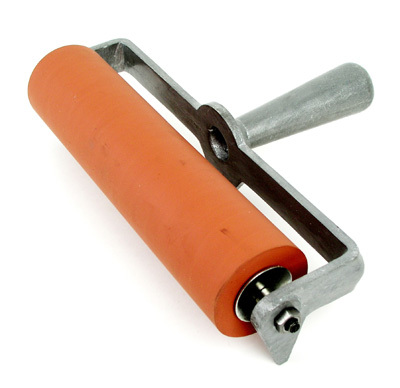 Roll the brayer across your plate. You should notice the ink start to stick to your ghost drawing. It may take a few passes of alternating between wiping your plate with water and inking it to ink the entire plate. Spray your drawing paper evenly with water and place it on top of your plate. Rub the back of your paper with a baren or the back of a spoon. If you have access to a printing press, that would be ideal. Carefully peel back the paper and leave it to dry. As I said earlier, there are many variations on this technique that you can experiment with. People have drawn their image into the foil with grease/litho crayons, touche, even Murphy’s Oil Soap! Each of these options would be fun to try out and should give you different results. To me, the trickiest part is inking the plate–I ruined the first two that I tried to print during that stage. I found that I didn’t use enough water when I was wetting my plate and the ink ended up sticking to everything instead of just my drawing. The nice thing is that it’s really easy to make a new one–just crumple up the old one and try again! What do you get when you put art and technology together? The UA Maker Club! A mash up between led workshop and open studio, the Maker Club combines traditional art supplies with tech-based materials and asks participants to explore the resulting possibilities. It’s a place for people to experiment, make mistakes, and have fun through tinkering. The Maker Club is also a place where collaboration rules: everyone can share their knowledge and learn from each other–students and staff alike! Because we (the staff) are not experts ourselves, it’s a great opportunity for us all to exchange ideas and gain new skills. The UA Maker Club meets every month and is open to anyone between the ages of 13-19. No prior experience is necessary and all materials are provided. Drop in to this month’s workshop on November 21 to make glow-in-the-dark clothing and accessories using electroluminescent wire and screen printing ink! I’m a big urban vinyl toy collector, and I especially love Kidrobot’s Munny line. If you’re not familiar with them, Munnys are customizable figures that are totally suited to makers and DIY-lovers alike. I’ve been tinkering with a few examples to show at this month’s vinyl toy-themed Urban Armor teen workshop with Mark Gutting and came up with both a fun and utilitarian Munny project that I hope you enjoy! One of the coolest things about Munnys is that you can pretty much turn them into anything you want with the right materials. You can find terrific instructions on how to turn a Munny into a speaker, so I thought I’d combine that idea with an Altoids mini-amp project that I was recently working on to create a Munny mini-amp for an MP3 player or smartphone. What’s nice about it is that the amp provides a little more juice for your music than the speaker alone, and since they are separate components, you can make more Munny speakers and interchange them with the amp. You can also use the amp with most any type of MP3 gadget! This is definitely a more intermediate to advanced-level project for ages 13 and up that would be perfect to do over a weekend. You’ll also need a few specialized tools and basic knowledge of circuits and soldering. Carefully take apart your mini-figure and give it a nice bath using mild soap to remove any oils, residues, etc. Using your speaker as a guide, mark a hole on the face of your Munny in pencil. Gently heat the vinyl with your hair dryer, making sure not to let it melt or warp. Cut the hole out with the exacto knife–be VERY careful because the warm vinyl cuts really easily. Test the fit with your speaker and cut away more material as needed. Use your knife (or a cordless drill, if you have one) to make a hole at the bottom of your figure’s body for the speaker cable to pass through. To make things easier, mount all of the vinyl parts on a styrofoam cup or something similar (I used a bottle and empty salt container) to spray paint. Take everything outside and give them a couple of nice, even coats. I gave the Altoids tin (which will be the housing for the amp) a coat as well, but it’s up to you. Now’s the time to make sure all of your electronic components are ready to go. Solder wires onto your speaker terminals and put together the amp components. I won’t list all of the steps here, but if you are using the kit I mentioned above, it comes with a great set of assembly instructions. Thread the speaker wire through the bottom of the figure’s head, into the hole at the body’s neck, then out through the hole you drilled at the bottom of the body. Fill the head cavity with batting and then pop the speaker into the hole. Use the hole punch to make holes in the Altoids tin to accommodate the volume knob and input jacks for the amp kit. Mount the circuit board in place with the silicone caulk. Plug the amp into the power adapter, insert the speaker wires into the appropriate terminals, and the audio cable into the input jack. Plug the other end of the audio cable into your MP3 player or other device, adjust the volume of the amp, and crank out some tunes–the sound is actually pretty impressive! There are multiple ways you can adapt this project, based on the components you have available. For instance, you could power the amp using a 9V battery instead of an adapter. If you come up with any mods or Munny projects of your own, feel free to email me your pics! 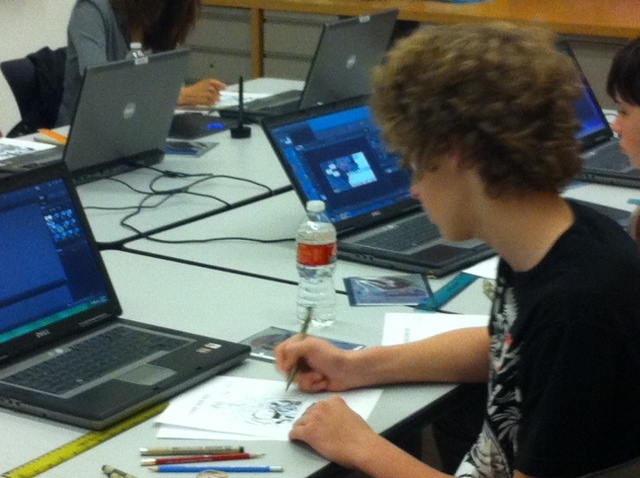 Dallas students had a great time learning about comics on Sunday, March 10, at the DMA’s Urban Armor workshop. Urban Armor is a program that allows teens and tweens to take a closer look at the Museum’s collection and create unique art in the DMA’s computer-equipped Tech Lab. Workshops are generally scheduled twice a month for two hours and are free; for more information, and to register, visit the DMA’s Urban Armor page. Local comic book artist and illustrator Kristian Donaldson led our recent workshop, which covered the basics of drawing comics and their history and progression. Donaldson completed his training at the Savannah College of Art and Design and has worked for Marvel, DC, Dark Horse Comics, and Dallas Observer/Village Voice Media. He has also taught several classes for young adults and college-age students across the U.S. 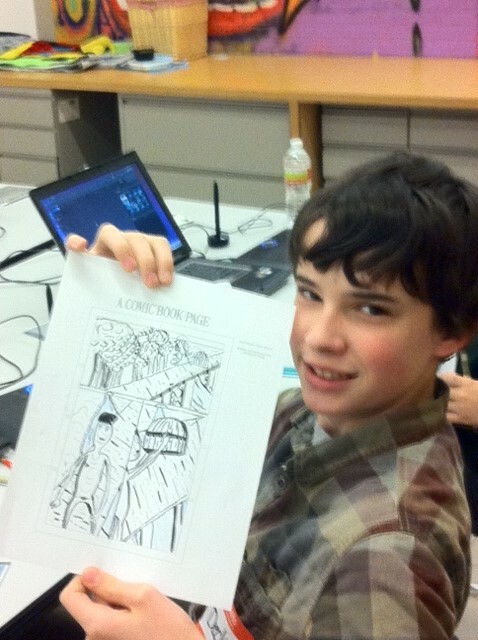 The workshop was inspired by the recent Arts & Letters Live program featuring Art Spiegelman on February 27. One of the perks of being the McDermott Intern for Adult Programming and Arts & Letters Live is getting the chance to create a program based on my passions and interests. I grew up in small-town Texas, far from any art institutions, so as a relatively new museum-goer I have become keenly aware of a certain gap in museum activities. While programs for children, families, and adults abound, similar activities for teens and young adults often do not. One of the things I love about the DMA is that we do have programs like Urban Armor, teen-friendly author events, and student discounts. When I saw that Spiegelman was coming to Dallas, I thought that the formula of comics + teens + local art programs at schools like Booker T. Washington + Urban Armor at the DMA + FREE = awesome. And so it began. Students age 14-17 gathered in the Center for Creative Connections to be schooled in the awesomeness that is comic book art. Kristian was very open-minded and supportive in his approach, encouraging the students to run with whatever style comes naturally, because there is no “right” or “wrong” way to draw a comic. While working with his self-professed current obsession with outer space, Kristian showed us step-by-step how to divide a basic template into three parts, set the scene with a general landscape, bring in human anatomy and emotion using shapes and positive and negative space, and lead into a story that is completely up to the artist. WOW. 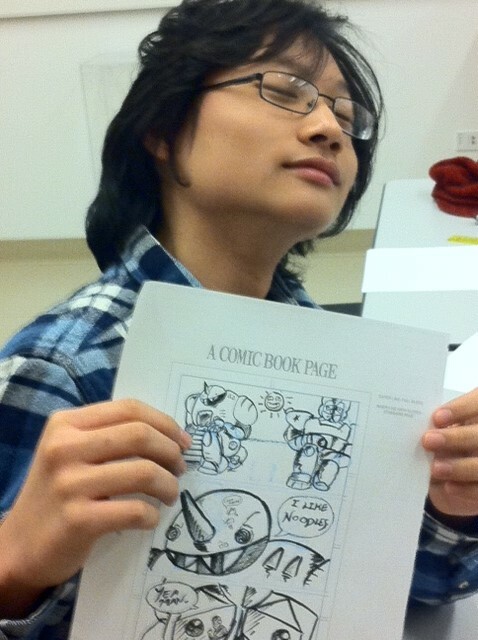 It was mesmerizing to watch the students create their own unique interpretations of what a comic should be. One student focused on what can only be described as a well-drawn noodle monster. I was amazed at the skill level and creativity flowing in the room. 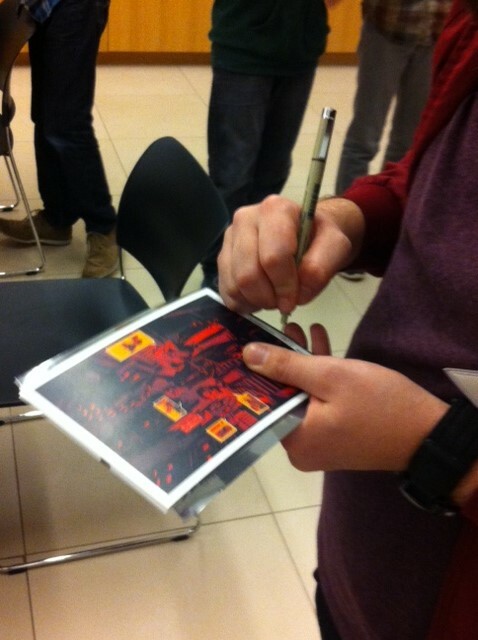 After the workshop was over, Kristian kindly signed some of his work for the students as they begged for another program with him later in the season. Comics: Part II, anyone? Emily Brown is the McDermott Intern for Adult Programming and Arts & Letters Live at the DMA.